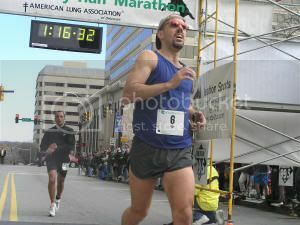 I posted this "long boring race report" (lbrr) on the Philly Runners message board along with a slew of other reports. 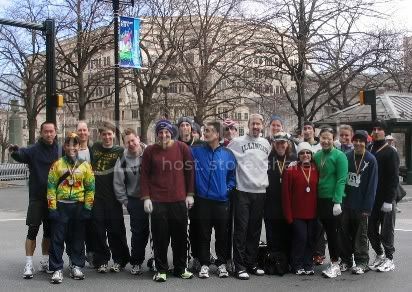 PR had a really good turnout for the race, making it into a real event. Before I start this lbrr, I must echo the previous accolades for the most excellent pre-race dinner and the remarkable feat of having 21 persons and 2 spectators from Philly Runners (PR) invade Wilmington. And to top it all off, I got to see Mony again. For those of you who don’t know it, Cesar Rodney has a nasty little course highlighted by a prolonged acclivity from mile 5 to mile 7 ½ which then becomes a screaming downhill from mile 10 to mile 12 ½, with the course finishing with a brutal quarter mile uphill to the finish. Against my better judgment, not to mention my dignity, I somehow ended up racing on a team called The Evil Killer Bunnies of Death (TEKBOD). I think I got hare and bunny mixed up. I took off on the downhill like an oil slick fire and was stupid enough to think, “Oh good, I got some time in the bank” when I hit mile 1 in 5:11. I was in the chase pack of 5 with the eventual winner already a good bit ahead of us. Over the second mile I was smart enough to let this pack go ahead and looking behind me as we circled around the stadium I didn’t see anyone for a ways. I was in sixth place, same as last year and I thought we were spaced out far enough to where this was how it would end. If I only knew. 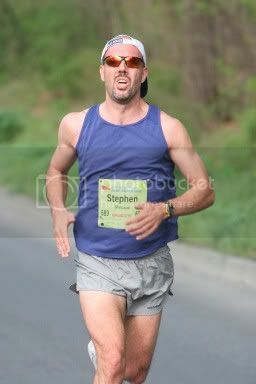 Mile 2 in 5:37 and I still had the fifth place guy in my sights. This was the pace I wanted to keep but it wasn’t to be. Mile 3 in 5:44, wave to Kevin and Cindy (spectating) and then its mile 4 in 5:57 and pick it up a little in mile 5 to 5:44 to cross the mat in 28:16. Time slipping, running alone, with the dreaded hill upon me, things didn’t bode well. Sure enough, miles 6 & 7 went by in 6:07 and 6:11, although I had the illusion of running faster as I reeled in number 5. As things flattened out miles 8 and 9 passed in 5:56 and 6:00 and I just didn’t have it to push it any faster. Mile 9 took me around the MBNA building and when I looped back to run against the oncoming people I didn’t see Ian. But I still wasn’t worried. The next two miles doubled back on the other racers and the PRs along with a bunch of others became a great cheering contingent. But even with this support I only managed to hold steady at 5:55 and 5:54. This last split was particularly disconcerting, as this was where I had gloriously screamed downhill in previous years running this race. I wasn’t going and my mind wasn’t pushing me. Mile 12 in 5:43, I was finally picking up some steam. My inner hare told me to relax, I’d still have fifth place locked up and I started to listen. I listened up to the point I snuck a glance behind me and saw the glint of aviator glasses gaining on me. Then the clapping of bystanders didn’t stop as I passed. Then the ominous sound of breathing, and then the footsteps. There was Ian. I gave him a friendly greeting that he must have misunderstood as an expletive. When we passed under a bridge I cocked an elbow and got ready to throw it but, alas, I’m not a very good evil killer bunny and he passed by. We rounded the hairpin turn into the final uphill to the finish and I knew that with all those Lemon Hills under his belt Ian was the better bunny that morning. I take consolation in leaving everything I had on that final quarter mile hill, and though Ian passed me I held off the next guy who was breathing down my neck. Final 1.1 in 6:26 and crossed the finish line in sixth place (first master) in 1:16:31. I felt I was in shape to do better, but my self-pity melted away quickly standing by the sidelines with Cindy and Kevin G. watching PR after PR land big PR’s. 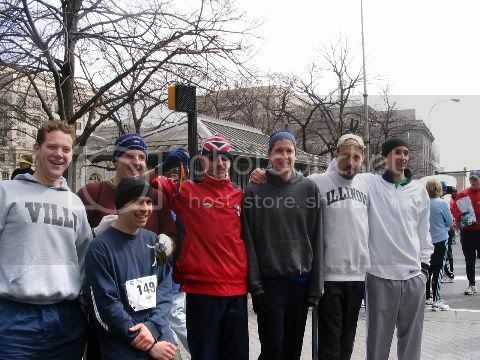 I’m sure I’m missing several but I remember Russ sneaking in (chip time) in just under 1:30, Tim coming in just behind him to a huge PR, Jim, Biz & Steve D all PR’d in double digits and I know I’m missing several more. TEKBOD won the team competition, the PR women’s team won as well, and the second PR men’s team won second as well. All in all a very successful day for Philly Runners. I need to remember it’s a long bloody race, don’t be in a hurry. If Cesar Rodney teaches me that, then losing to Ian will have been worth it. He ran the race I like to run, just bide my time and slowly make a move as the finish approaches. And now Boston becomes much more interesting. Care to suggest a wager, Ian? Loser hydrates with a nice tall glass of Charles River water, perhaps? A shot of me (with proof of time) taken from the race website.